14:41:39 Saturday afternoon and Gav/Stu were still AWOL, so we decided to press on with our plans regardless. 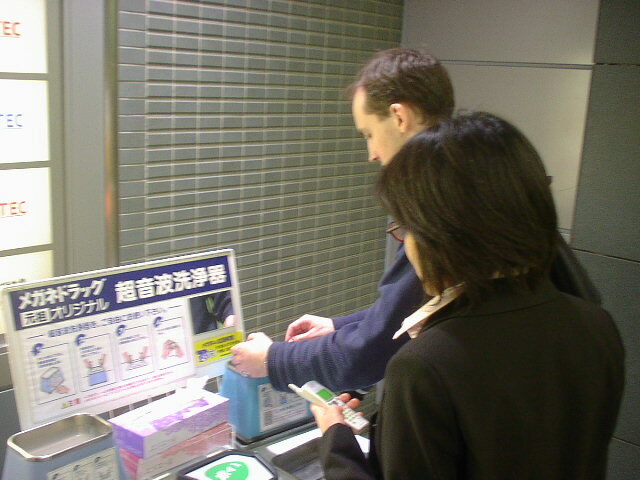 Another nostalgic event - Chie and Leon cleaning there glasses in this passageway in Shinjuku -just like five years ago. 14:42:39 There was all many of cloudy stuff coming off Leon's glasses but this picture hasn't really captured that. 15:35:27 We thought it prudent to try and pack in a decent meal before continuing with our plans, so popped into Lorenzo's favourite spaghetti place in Shinjuku. 17:17:40 So, here we are on the train on the way to Takaosan. I think Leon is re-enacting the Japanese joke from last night (but with oolong tea instead of beer). 17:17:45 I was taking advantage of the almost empty train to spread out a bit, and get some much needed rest. 18:09:36 So here we are at Takaosan now, one of the temple buildings on top of the mountain. 18:09:41 A bit blurry - I think last night's beer drenching may have had an adverse effect on my camera. 18:32:15 It was getting pretty dark by this point, so not much chance any pictures were going to come out! 18:33:09 A picture of the three of us at the top of the mountain, in a place were there were less trees and so still a bit of light. 18:33:48 Leon suggested putting the camera on a slow shutter setting then moving about a lot. 18:50:29 The moon was just popping out, and I rather liked this night time scene with some silhoutted trees and part of the roof of one of the temple buildings... unfortunately the picture didn't really do it justice. 19:08:11 The main reason for coming to Takaosan was to visit the beer garden. It was very crowded and on a one-in-one-out sort of system, but we were quite determined to sit it out, aided by the free beer they give you whilst you're waiting. 19:55:24 Eventually our perserverance paid off, so here we are in the beer garden. 20:52:20 Chie and Leon having a bit of a fight. 20:53:30 One of the great things about the Takaosan beer garden is the night views out over the suburbs of Tokyo. 20:53:37 Same again in landscape to get a bit more of that night view in. I was obviously really struggling to take non-blurry pictures today! 20:53:58 Chie did a much better job. 21:27:18 Another group's picture looked more fun than ours. 21:31:07 Note here my hands were actually quite steady, but Chie was moving. 21:35:51 Waiting to get on the cable car on the way back down. 21:36:57 Here's the cable car (or Fenicular railway?). 21:37:49 Leon attemts to get his head stuck between the bars. 21:45:35 Leon wearing Chie's hat. Nice. 21:47:05 Down at the bottom of the cable car run. 22:03:02 Leon on the train on the way back to the centre of Tokyo. 22:03:14 I think he's just pretending here. 22:49:34 Apparently I also had to wear Chie's hat. 00:10:03 Finally we got back to Shinjuku were we met up with Gav and Stu in the Dubliner's. 00:42:09 After that we went for a somewhat fruitless wander to try and find somewhere fun around Shinjuku. I think this is a KFC advert, and Leon/Gav were somewhat surprised at the presence of bacon. Or something. 00:58:20 This is Golden Gai, which we inspect for interesting bars etc. It was a bit disappointing. So a short while later the boys decided to head on to Shibuya, but me and Chie decided to call it a night.